The Pearson Institute partnered with the University of Chicago's Institute of Politics to welcome U.S. Senator Tammy Duckworth (D-IL) for a conversation on her career in public service, her work representing Illinois in the U.S. Senate, and her perspective on issues related to global conflict and breakdowns in social order. What can we do about inequality and capitalism? James Robinson, Economist, Political Scientist, and Author of "Why Nations Fail," explores the origins of economic disparity, and why nations are failing today. 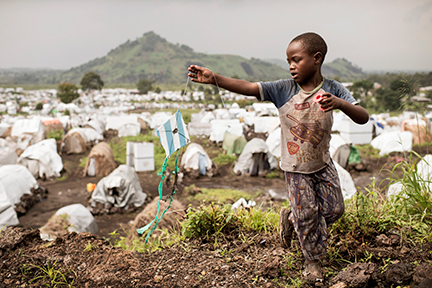 GOMA, DEMOCRATIC REPUBLIC OF CONGO – APRIL 2013: A boy plays with his homemade kite on a volcanic rock above the Bulengo IDP (Internally Displaced Persons) camp.